I don’t know about you, but there is nothing more refreshing in the summer than a cool, delicious salad. _Carrot & Zucchini Salad_ is perfect. It gluten free, dairy free and can easily be made egg free and vegan. Need a fun fresh twist to shake up your summer dinners? 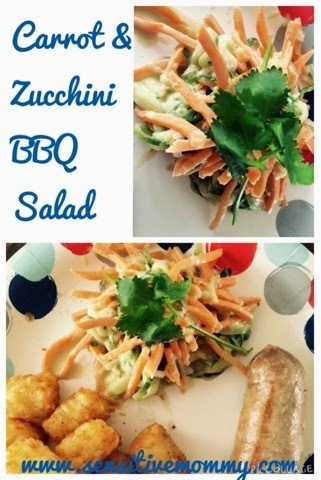 Try Carrot and Zucchini BBQ Salad. It is cool, zesty and best of all … you don’t have to heat up the house with my no-cook recipe. 1. Julienne or spiral slice your zucchini and place in a strainer. Add a few dashes of sea salt to the zucchini and toss to coat. Allow to sit in the sink for about 20 minutes. This will help some of the excess water drain out from the zucchini. After salting the zucchini, wrap it in a few paper towels and squeeze gently to remove any remaining moisture. As your waiting on your zucchini mix all the ingredients for your dressing in a medium bowl with a whisk or fork. Mix zucchini and pre-shredded carrots on a large bowl. Drizzle dressing over veggies, tossing to combine. Add as much or as little dressing as you’d like. Serve and enjoy! Store for no more than 6 hours in refrigerator or the zucchini will become soggy. Optional: Add craisins, raisins, or yellow raisins for a sweet kick to this zesty summer side. Add unsalted, roasted cashews, peanuts or pistachios for a protien packed crunch. This recipe is gluten free, soy free, dairy free, and top 8 allergy free, except egg. If egg-allergic use veganaise. Hickory Creek _Just Mayo_ is vegan and yummy! Enjoy this cool and zest Carrot and Zucchini BBQ Salad this summer with your family and friends.